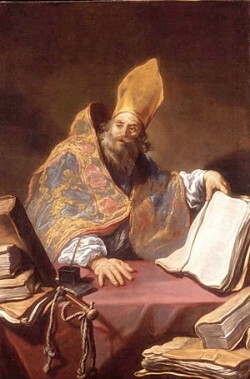 Today is the memorial of the great St. Ambrose. Bishop of Milan, friend of Augustine and Monica, great teacher of the Milanese clergy, and greatmystagogue for the laity, Ambrose is one of my favorite figures from the era of the Fathers. From the first post on this blog, I’ve returned to him again and again (sometimes in friendly disagreement withAdrian Murdoch, esteemed fellow of the Royal Historical Society). You can read selected backpostshere, here, here, and here. Here’s a fascinating recent study of Ambrose’s approach to the formation of the laity: Ambrose’s Patriarchs: Ethics For The Common Man. And Father Z has posted a lovely appreciation of Ambrose: St. Ambrose: silent reader, croaking crow – beloved of Augustine, hated by Jerome. I recommend celebrating the day with great quantities of these. I’ve never been to Milan to visit Ambrose’s grave, but I’m slated to go in November of 2011.